The Father Heart of God Bible Study has finished but before we leave it altogether I thought I would show you the cover I made. I used a heart stencil and 3 colours of Distress Ink. I used some alphabet stickers which don't show up too well but I really love the letters so I don't mind. I measured some ribbon to use as a closer. I made a hole through the ribbon and the paper and added a brad. The split pin on the back doesn't show up too omuch and I could put something over it to hide it if it bothers me later! Here is the ribbon tied so that the zigzag book doesn't fall open. I made a video of the whole journal. Welcome to my creative response to The Father Heart of God creative Bible Study. You can find the details of today's session on The Father Heart of God blog. I showed how I made my backgrounds in this blog post. I made all the backgrounds at the same time and then cut and scored the papers to make 5 pages for my book. I decided that I would do every page in the same way throughout the journal and to keep to a limited palette of colours. I chose one verse from the Bible Study, printed it out and cut it up. I inked the edges and then glued it to the outside of the folded page. This is the reverse of the page with some doublesided tape already attached down the edge of the page between the scored line and the edge of the paper. I drew the wavy lines as before. Using a black pen I wrote my journaling so that the letters fitted the gaps between the wavy lines. I went back through with coloured pens putting pattern into some of the letters and circles between the words. The circles with dots in look a bit like frog spawn but once I'd done the first page I had to stick with it! Here are pages 4 and 5 together. On February 28th there will be one last post in this series showing my completed journal. Thank you for stopping by today. If you haven't already joined in with this study you can join any time. It is my rule in the Take Me Deeper group to tell people they are not behind when they are not keeping up with posting their weekly reponses to the devotionals. So I can't say that I am behind. Let's put it like this - I am now all caught up. In January I used a theme of journaling boxes through the month's art work and decided I quite liked the idea of a theme. This month it is a technique. I learned it in a new class from Diane Marra: Mixed Media Layering. Diane's page. Used with permission. It's a stunning page and a great class and I have done my take on it. Firstly on each page that I did I stamped a large heart and then wrote my journaling in it using a pencil. I followed the instructions from Diane's class - possibly somewhat loosely - but if you're a regular reader you will know I don't ever want my work to look like a copy. However in my pages you can definitely see Diane's influence. I used Distress Inks on this instead of spray inks and when I tried blending them together with a wet wipe the pencil writing smudged! You can sign up for Diane's class by becoming a member of His Kingdom Come. The class is only $8 or around £5. Or you can buy it with 4 other classes for a total of $35 or just under £23. I went back through with coloured pens putting pattern into some of the letters and circles between the words. Here are pages 3 and 4 together. On Saturday February 28th, His Kingdom Come is launching its first collaborative class prepared by the 5 members of the Foundation Team. 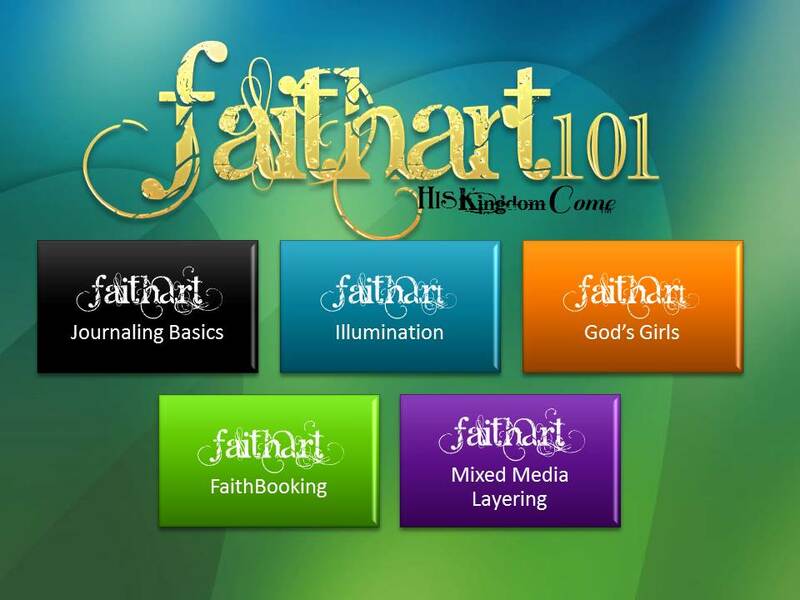 Faithart 101 has been developed for beginners to Faith Journaling. The 5 classes cover basic journaling information, how to translate scripture into art, the basics of drawing people, using scrapbooking techniques and mixed media techniques. Each of the 5 classes can be purchased individually or all 5 can be bought together with a discount. The individual classes are $8 each but you can buy all 5 together for $35. PayPal will sort out the currency for you if you live outside the United States. Once you have purchased your classes and have been added to the class site you can work through the classes at your own pace. You will have unlimited access to the classes you have purchased. The Foundation Team consists of Bernice, Mary, Shonna, Merri and Diane and each day this week you can find out more about each of us on our personal blogs. 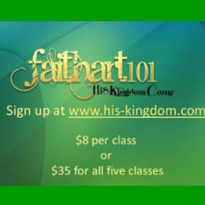 We will also tell you about the class we are teaching as part of Faithart 101. Bernice at Newly Creative on Sunday 22nd Feb - here today. Diane at Adore Him Creations on Monday 23rd Feb.
Shonna at Twisted Figures on Tuesday 24th Feb.
Merri at Connecting Faith and Creativity on Wednesday 25th Feb.
Mary at Me, With My Head in the Clouds on Thursday 26th Feb.
My class is Journaling Basics. Quite possibly anything that I happen to be doing at the time. When the Gelli plate is out - that's my favourite! When the stencils are out - they are my favourite! I really love using Thermofax screens which are an easy way to screenprint. I used them on this page that was featured in the book Art Journal Kickstarter. Who is your favourite person in the Bible and why? What Bible verse do you regularly rely on? 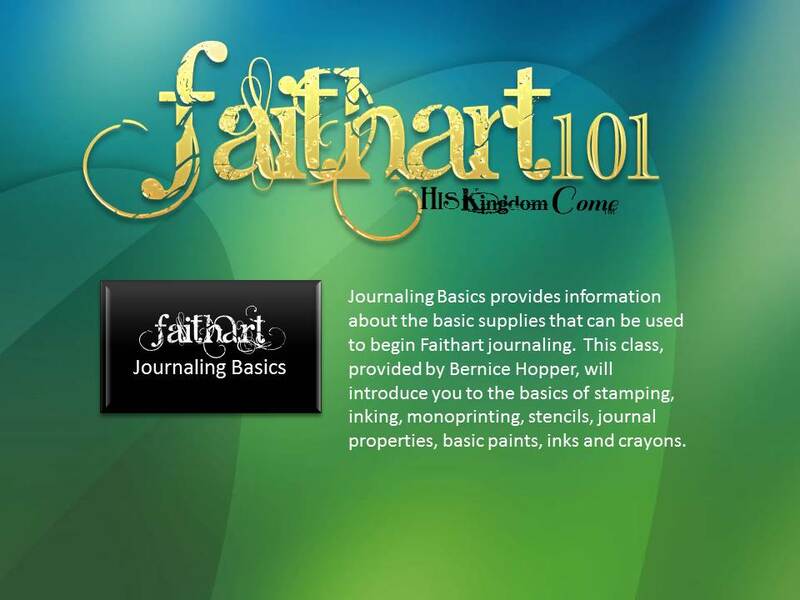 Join us on February 28th in taking Faithart101 at His Kingdom Come and learn more about Faithjournaling. If you are not already a member of the His Kingdom Come community then please sign up. You can purchase the class or classes from today. I drew the wavy lines as before. However I changed the green pen for a lighter colour green. Here are pages 2 and 3 together. I stuck the journaled page into my zizag book. Here you can see the page being opened. And yes I know it's February! But I spent all of January fighting my word. To find out how the word chose me you can read this post. You may remember that I planned to do an art journaled calendar for each month through 2015 and this was my January calendar. About 10 days into the month it became obvious that I wasn't going to fill in what had happened each day and after some thought I decided to give up on the whole calendar aspect of the journal. I removed the flap attached to the right hand page so that the Thirst page would show. I removed the 'flowers' from the left hand page. I covered the page with gesso. I thought that was too bright so I covered it with a light blue. And as it was drying, wiped some of the pale blue off so that the layer underneath showed through. I had a spare page left over from when I pulled pages out of my other Dylusions journal and fixed it to the left hand page with washi tape. I had been using it under pages I was painting so that is why it has a stripe of blue acrylic on it. I wiped two Distress Ink Pads over the page. I tried blending the inks with a wet wipe which wasn't totally successful. Then using a blending tool I filled up the page. I used a stencil to add the spray shapes. I found some alphabet stickers and checked they weren't too big for the page by attaching them to a clear ruler. One of the prompts for January in Logos365 was to make an acrostic. I found words that matched some of my goals for the year and stuck down more alphabet stickers to make the words. I found Bible verses that went with each word and printed them out. I cut them up and inked the edges before sticking them down. I still have the pages to do under the flap. I'll share those soon.